From the beginning of man’s time on earth, gender roles have been a popular topic in all cultures of the world. Discussions of woman’s rights have been heated and continuous as our modern society has progressed to new heights in equal rights with men in voting and employment opportunities. In The Church of Jesus Christ of Latter-day Saints, (often mistakenly called the Mormon or LDS Church), we believe that women and men are equal in the eyes of God but have different gender roles which provide for the preservation and flourishing of the family. From the creation of the world, women have always been the child rearers as well as the child bearers. We are the nurturers and have special gifts to raise babies to adulthood. Men have been the hunter/gatherers/farmers/workers to provide for and protect the family whenever possible. Each gift and talent given to men and women are used for gender roles in creating families together. One cannot be without the other. In the Church of Jesus Christ, “priesthood” is the power and authority to act in the name of God. Ordinances performed by men who hold the priesthood are sealed in heaven as they are sealed on earth. Service performed by men who hold the priesthood, including administrative duties or exercising the gifts of the spirit, is ratified in heaven and guided by revelation through the Holy Ghost. Since the apostolic authority of old was lost when the original apostles died, God restored it in modern times—first through John the Baptist conferring the Aaronic Priesthood upon Joseph Smith and Oliver Cowdry, and then through Peter, James and John, who conferred upon the same two men the Melchizedek Priesthood. Women share in this priesthood power. 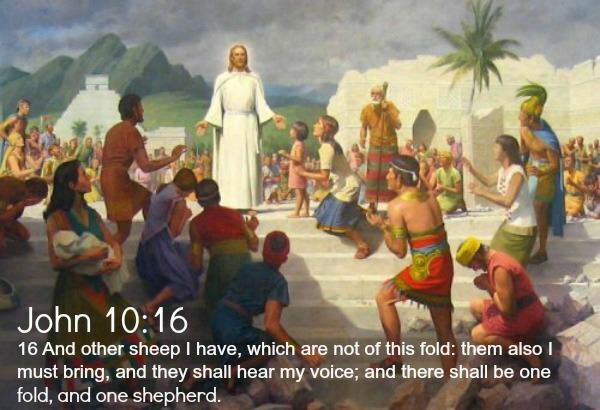 They receive revelation for their callings and duties, perform ordinances in holy Mormon temples, and consider their roles as child bearers in this great plan just as important to the duties of men who hold the priesthood. When all is said and done, and our grandest wishes for exaltation into the presence of God are fulfilled, a man cannot go without a woman, and vice-versa. The two must be together to achieve a fullness of joy. 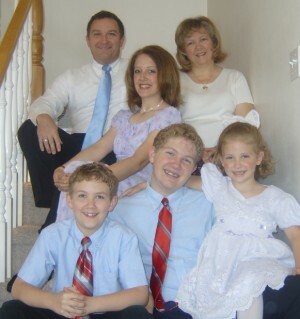 Through study and understanding, men receive the priesthood to act in the name of God and give of themselves selflessly in service to others in blessing those who are ill and in need of comfort, naming and blessing babies, baptizing converts, visiting each month to give watch-care to families and many other callings which pertain to the organization of the Church. The priesthood leaders have always been ordained of God to lead the Church in righteousness. Since the Church of Jesus Christ has no professional clergy, women also play demanding roles in leading various auxiliary organizations, such as those for Young Women and “Primary,” for children 18 months to 12 years old. These are tremendous responsibilities. The women’s organization of the Church of Jesus Christ is the oldest and largest in the world. The General Relief Society President leads around 6 million women. Not many leadership positions in the world are this demanding. Who has more responsibility? 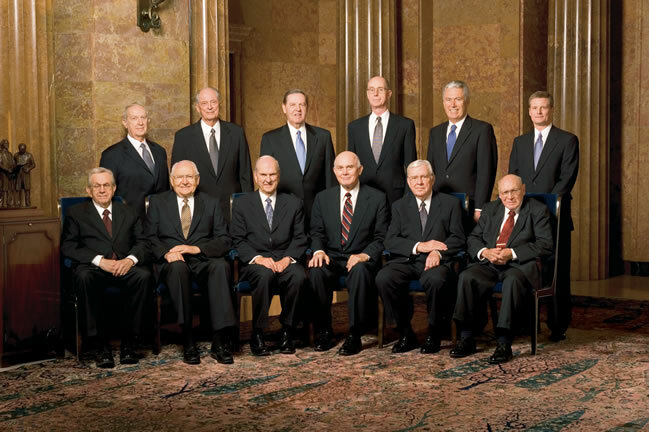 The LDS general Relief Society President, or a female executive in the careers of the world? Even on the congregational level, these are huge jobs. Just recently online, questions have been raised about the opportunity of women being ordained to hold the priesthood themselves. The belief that with the women ordained to the priesthood, they can have equal rights with the men in church leadership. This misunderstanding of men and women in priesthood ordinations has been discussed online and many misconceptions are very misleading. As we study and learn of God’s will for His children, we can know from personal revelation our own gender roles in leading happy, full lives and know within our souls we are all important in God’s kingdom. Many LDS women have expressed their own divine nature as women who bear and raise children and feel comfortable in their roles as mothers, daughters, sisters, aunts and grandmothers. We do not feel the need to validate ourselves as women by being ordained to the priesthood. Women being ordained the priesthood would upset the balance of the plan for women on earth. We know we are all loved by our Heavenly Father as women with virtuous characteristics and believe we should fulfill our life as such. We are neither oppressed nor treated as “second-class citizens.” Most of us are so busy, the thought of adding priesthood responsibility sounds daunting. 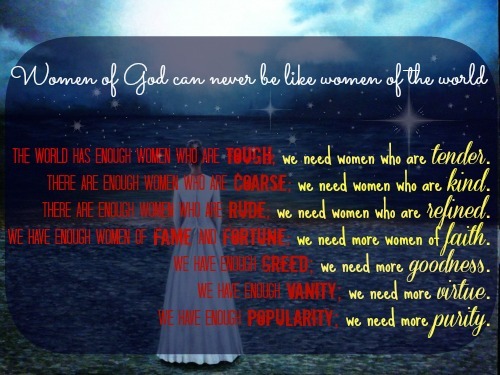 Women of God can never be like women of the world. The world has enough women who are tough; we need women who are tender. There are enough women who are coarse; we need women who are kind. There are enough women who are rude; we need women who are refined. We have enough women of fame and fortune; we need more women of faith. We have enough greed; we need more goodness. We have enough vanity; we need more virtue. We have enough popularity; we need more purity. As women of The Church of Jesus Christ of Latter-day Saints, we can recognize and embrace our roles in all aspects of life as we move forward in our faith, family, community, employment, and church callings. With the support of the priesthood, we can accomplish the goals in our life and be happy with who we are as women. This article was written by Valerie Steimle, a member of The Church of Jesus Christ of Latter-day Saints. Despite being born and raised a Yankee, Valerie Steimle moved to southern Alabama with her husband and nine children and have found herself partial to the south. She has always been passionate about strengthening families and despite being busy with her own, felt compelled to write about it. Starting with a column in the local newspaper, she has since published several books regarding family issues. During that time her husband passed away suddenly and she was left to raise her five youngest children alone. She has moved forward with faith however, and has found happiness in her God, her family and her writing.